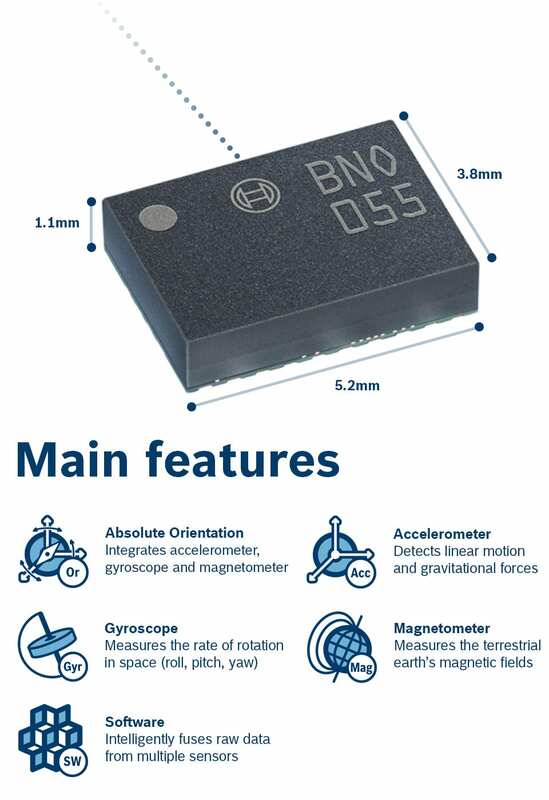 This is a embedded-hal driver for Bosch's Absolute Orientation Sensor BNO055. It is device-agnostic and uses embedded-hal's Write/WriteRead (for I2C) and Delay traits for its operation. Uses and re-exports nalgebra's Quaternion for quaternion reading and Rotation3 for Euler angles. Due to the BNO055 firmware bugs, the Euler angles reading shouldn't be relied on. I recommend to stick with quaternion readings and convert it to the Euler angles later and if needed. BNO055 allows to change default axes to meet chip orientation with actual physical device orientation, thus providing possibility to place BNO055 chip on PCB as suitable for designer and to match chip's axes to physical axes in software later. It is also possible to flip sign of either axis of the chip. For better performance, it is advised to connect and use external 32k quartz crystal. BNO055 allows to change its I2C address from default 0x29 to alternative 0x28 by setting COM3 pin LOW. Temperature is specified in degrees Celsius by default.